digital SLRs on the market today. 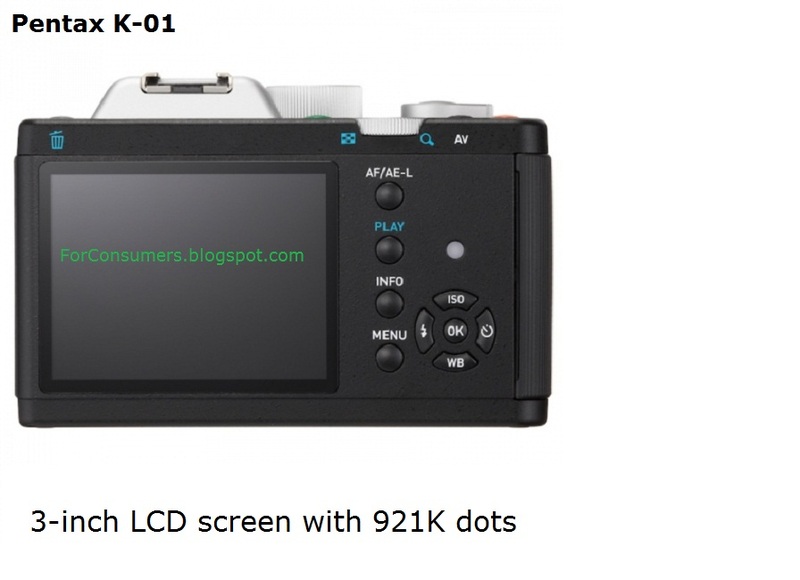 Pentax K-01 is a very popular camera already and it has a lot of fans worldwide. Many user ratings and reviews give it very high scores and there is a reason for that of course. 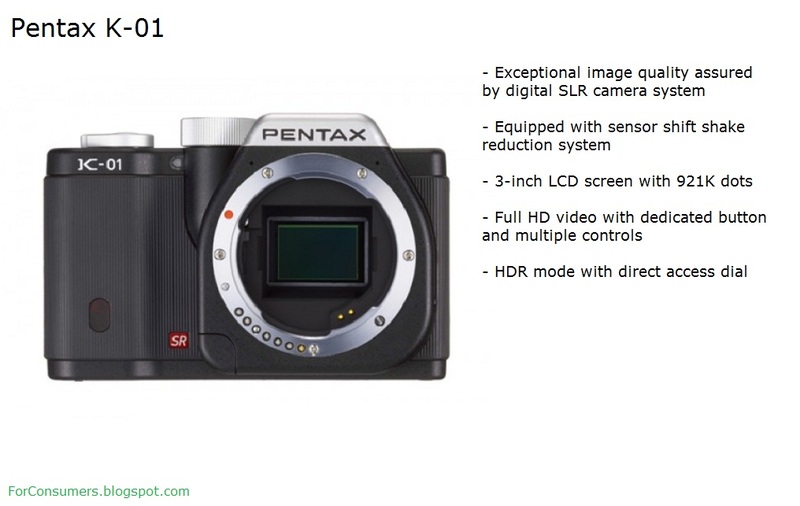 Pentax K-01 is equipped with many some innovative features as well as many of the standard options for a DSLR camera. The Pentax K-01 has a CMOS image sensor measuring 23.7 millimeters by 15.7 millimeters. This extra-large sensor assures high-speed readout of image data signals. The K-01 also features the "PRIME M" imaging engine to assure first-rate movie recording performance in a digital interchangeable lens camera. 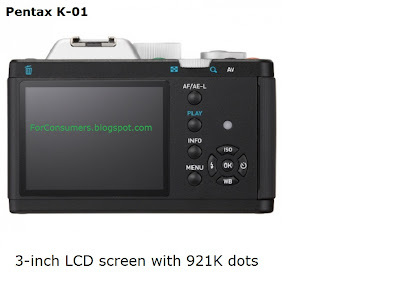 The K-01 is equipped with a sensor shift shake reduction system, which moves the sensor in the opposite direction than the one of the camera, so that the sensor remains in the same position during the shooting of the pictures.The K-01 features a large, easy-to-view, high-resolution 3-inch color LCD display (921K dots) for viewing your masterpieces. Its wide-view design assures a clear view of the monitor from approximately 170-degree horizontally and vertically, making it particularly useful in low and high-angle shooting. The HDR (High Dynamic Range) mode, which produces one extra-wide-gradation composite photo from three images taken at different exposure levels, has been upgraded to create a greater range of visual expressions. This upgraded HDR mode can be instantly elected with a turn of the mode dial. The user can take advantage of features to select one of three exposure increments as well as the level of effects, while an automatic position adjustment function assures precise alignment of three images even when they are taken with a handheld K-01. The K-01 makes high quality videos in Full HD with ease using the H.264 codec and also has a large range of filters and other creative function for you to be able to, not only shoot movie, but create movie. The K-01 is equipped with all the connections to record not only the video, but also the sound, and to export all easily on your PC or TV via the HDMI cable. 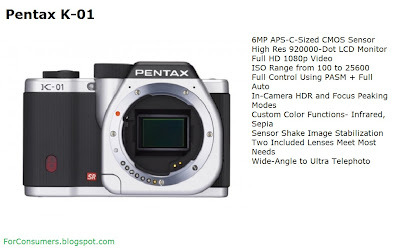 The price of the Pentax K-01 camera varies around $850 and $1200 depending on the lens kit that will come with this very good digital SLR camera. Pentax K-01 comes in three different color choices - white, silver and black. You may also want to check the full Sony Alpha SLT-A65V review - 24.3MP digital SLR camera in the same price range.